We stand in the middle of Enchanted Rock starvin' as we look around tryin' to find how we'd strayed from the trail. "We're on a rock," I lament. Frustration quickly grows as Avery continues to wander off not realzin' one of the most important rules of hikin' is to stay on the path. We quickly find our way back thanks to a fellow hiker, and I spend the next minutes down the base of the rock yammerin' on about how I was right the whole time, and we should have taken the left ridge, and the trail would be there. Avery looks annoyed and hungry as we continue. Moments later were at the Ford strippin' of the hikin' boots and ready for food. A Park Ranger stops as she drives by our car. She wants to know how we enjoyed the hike and make sure we were safe gettin' out the with storm rollin' through. "Yes Ma'am but I saw a sign for Llano Texas when we came up the FM. How close are we?" I ask. She smiles, "Take a left out and head about 30 mins North and you'll be there." "Thank you," I reply. "We want some Cooper's before we head back to Dallas." Avery groans. 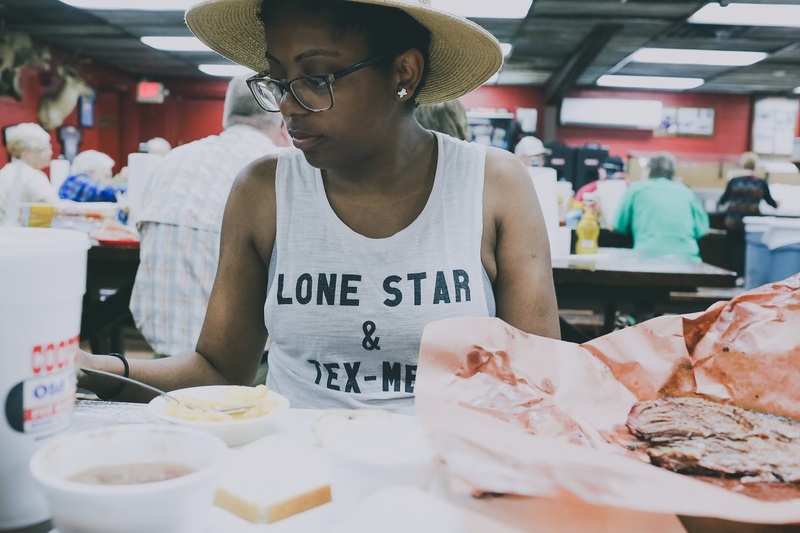 "Girl, we had BBQ yesterday in Lockhart Texas," he complains. I snicker. "It's not every day we're in the Hill Country, and we're like 30 minutes away. We're eatin' Cooper's," I holler. He mumbles under his breath as he loads in the car. We quickly exit for Cooper's Old Time Pit Bar-B-Que. We walk up to the Pit Master, and the aroma hits us before we even have time to speak. An abundance of beef and goat stares back at me. I chuckle to myself as we look at the smoker of meat. 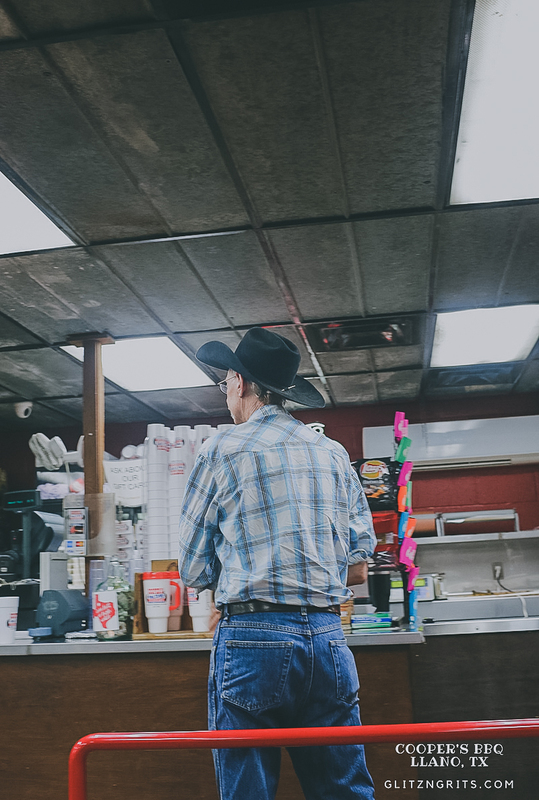 We'd spent the last week in Victora, Texas tryin' to explain' to Non-Texans that BBQ is smoked beef with no sauce. Anythin' else is a lie and not REAL BBQ. But if you must smoke other meats addin' sauce is an insult to the Pit Master. Here lie Cooper's validatin' my Texas heart. "All the brisket," I say. And the Pit Master smiles as he loads the tray with brisket. Avery points to the goat, and I shutter. We enter and order all the nutritionally mangled veggies and Coke. We take our picnic table seats inhalin' every piece of white bread we can get our hands on at the table. We're so starved I almost forget to take pics until Avery makes a snide comment. I whip out the camera but not before a cowboy next to us notices and engages in conversation. I tell him we've been in Victoria, Texas the last week helpin' with Hurricane Harvey clean up but we decided before we headed back to Dallas to camp a night at Enchanted Rock and eat some famous Cooper's BBQ. He smiles before goin', "of course you did. Have a safe trip home." We thank him but not before I snap a few more pictures. We love, love, love Coopers! 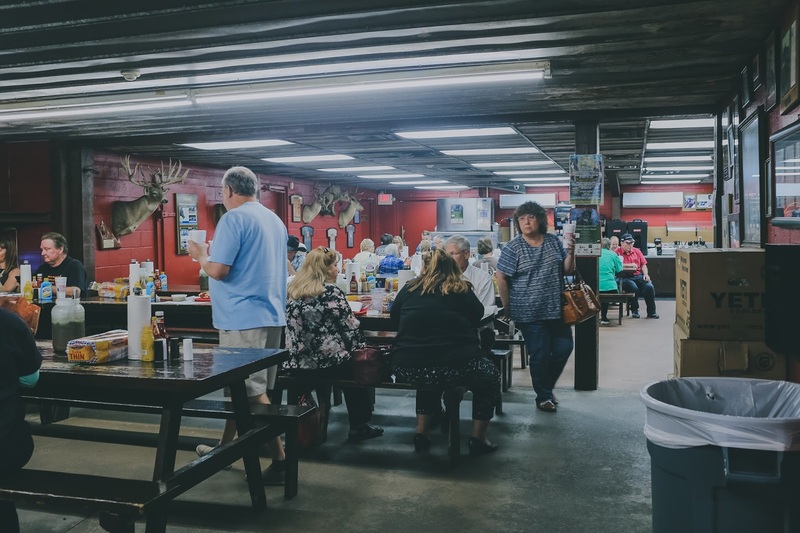 We camp at Mason (about 30 minutes from Llano) twice a year so we always try to eat at Coopers when we are there. Did you like it?